Backyard control that goes the distance. Delivers long-lasting control against mosquitoes, flies, spiders and a wide range of other insects. 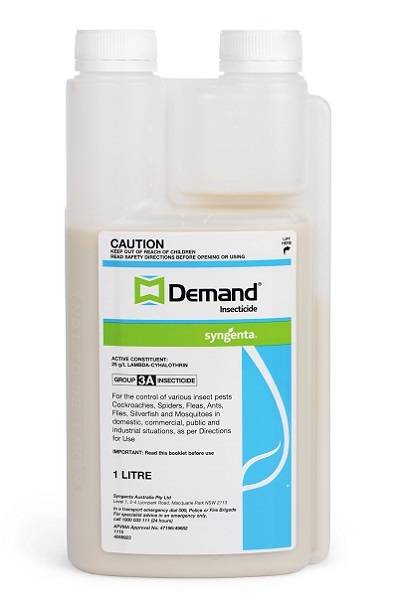 DEMAND Insecticide delivers long-lasting control against mosquitoes, flies, spiders and a wide range of other insects. Its versatility makes it a winner – apply it outdoors or indoors, to foliage, on ornamental plants and shrubs, on hard surfaces like outdoor furniture, under decks and in plant pots. How does DEMAND deliver long-lasting control? DEMAND uses iCap technology, encasing the active ingredient in a polymer microcapsule, suspended in water. On application, over 64,000 microcapsules stick to every square metre of treated surface, keeping the active ingredient protected from the environment. This means the active ingredient lasts longer, allowing more insects to move over the treated surface and pick up the microcapsules on their bodies. The active ingredient then quickly moves out of the microcapsule and into the insect, providing a rapid knockdown followed by a quick kill.